Hazyview, Mpumalanga: Day One of Wolwedans in die Skemer’s technical recce. In attendance is Director Jozua Malherbe, Cinematographer Tom Marais, Production Manager Maryke Piketh, Production Designer Waldemar Coetsee, 1st Assistant Director Coenie Van Dyk, Unit Manager Adriaan Wildenboer, Set Dresser Chris Joubert, and myself, Research Assistant/Director’s Assistant/Token Rooinek James Stent. This post will be marginally shorter than the last, but I am afraid that I am a bit spent from a full day of reconnaissance in a particularly hot and humid part of South Africa. Today we visited the most important location in the film. Casa do Sol is to act as the stand-in for Hotel Njala, the centre for the film’s events. For half of our party, it was our first encounter with the hotel (Jozua, Tom, Waldemar and Maryke have reccied prior to this trip) and for the newcomers it was a revelatory experience; the pictures of it that we’ve set up on our office wall, as lovely as they are, have not done the place justice. The hotel is set on a sprawling estate, bordered by jungle and an elephant sanctuary. 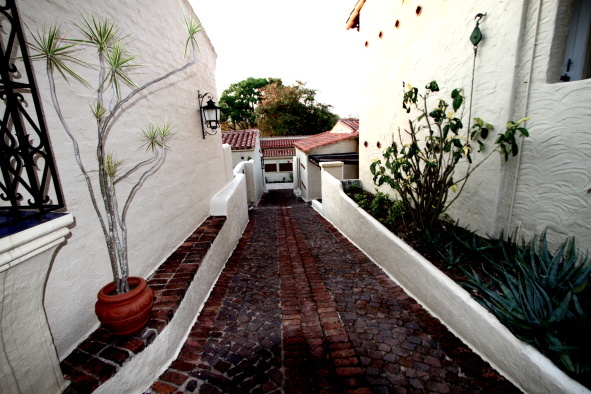 A collection of Tuscan style buildings, with thick stone walls, red-tiled roof, and cool paving has been raised here. The Casa do Sol gardens are immaculate and delightfully idiosyncratic - a resident zebra insouciantly makes its way around the hotel’s lawns. When Leon van Nierop visited the office during last week’s the script read-through, he mentioned his relief about our securing Casa do Sol as our Hotel Njala. He could not imagine another place being quite so perfect a setting for his story, considering the first draft of the radio play as well as the film was written there. It’s not an intrinsically ominous place (it’s a bright and beautiful place), but its arches cast heavy shadows, and its corridors are long enough to hide the multitude of secrets contained in the film. The aim (and it is a grand one) is to make Casa do Sol as integral to the feel of Wolwedans in die Skemer, as the Timberline Lodge was to the Shining. 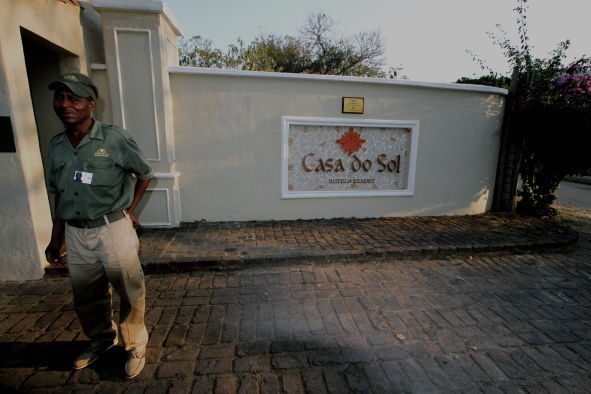 Casa do Sol has the air of a classic location about it, and today was about how best to capture the dark side of the hotel, so that it emerges as the site of murder and mystery it is meant to be. Jozua and Tom with the rest of us trekked the corridors making detailed notes of what will happen where, when, how and with whom. We came prepared with files filled with breakdowns and other supporting documents which enabled us to work through each location with the efficiency of a Japanese Automobile production line. The structure also gave the team space for inspiration: ideas come easily when there is a solid foundation from which to work from. As we walked around the Hotel and its surrounds, picking our way through each scene and every possible set-up, I could sense the film emerge as a vivid entity. Scenes would raise themselves from page and picture as camera placement and blocking were worked out. Jozua has created a consensus around his vision for the film from which this team flourishes. It was a good day, and an important day. I was, perhaps, not effusive enough in my previous post about the team that will be creating this film. They work with passion, with laughter (Afrikaans is a tongue that lends itself to humour), and, most importantly, with intelligence. The two members that are the newest inclusions to the team, 1st AD Coenie and Unit Manager Adriaan, were quick to impress. They radiate the same positivity as the others, and their skills are a boon to the production. The frame of the movie has been set. The world has been crafted from script and reference and imagination, and now we fill in the rest of the picture. We’ll be here in Hazyview for the rest of the week, visiting all of our other locations and working out the logistics of the picture, and if today was any indication of how the rest of the out trip will progress then it will be a supremely excellent week. And that is all I have to say for today. I was certain that I’d have my signing off line down pat for this post, but it slipped low down on my priorities, and now I’m too worn out to work one out. Instead I’ll choose one from the stock phrases of the English language like: This was James Stent, and thank you for reading this post. Does that work? Way awesome, some legitimate factors! I recognize you generating this short article offered, the remainder of the web site can also be large high quality. Have a very enjoyable. I would like to thnkx for your efforts you might have place in composing this web site. I'm hoping the same high-grade web site submit from you in the upcoming as well. In fact your creative creating abilities has inspired me to acquire my own web site now. Actually the running a blog is spreading its wings quickly. Your write up is really a excellent example of it. These are actually enormous ideas in about blogging. You have touched some good things here. Any way keep up wrinting. Wow that is really cool: By itself, the EPDM Liquid Rubber® membrane will exhibit the characteristics of its EPDM chemistry i.e. U.V. ozone stability, excellent ponding water resistance and long-term retention of flexibility. EPDM Liquid Rubber® applied over generally sound singly ply EPDM can extend its life another 20 years. The useful life of metal roofs will also benefit greatly when EPDM Liquid Rubber® is applied. It is recommended that a corrosion inhibitive primer first be applied to areas where severe rusting has occurred.